Devon County was a great way to start the show season off for us as we took the breed championship in the Devons with our senior stock sire Boskenna Donal, who won his class then took the male and overall champion. Donal was purchased from the Devon Society sale and is a son of the 20,500gns Yeomadon Ferdinand. He also went on to win the reserve native interbreed championship and won the HRH Edward, Prince of Wales Challenge Cup for the Best Devon or South Devon. He then teamed up with Colleton Marion 27th to take the reserve interbreed pairs championship. In the Simmental team Priorton Foxglove, a Loxton Barnaby daughter won the June 2014-born class, while Loxton Eternity, a Peatling Brendan daughter out of Loxton Verity stood second in her class, while Priorton Futurity, a Ryden Bosley daughter also won the January-born yearling heifer class. Next show for us will be Royal Cornwall with a quick trip to Bath and West in between as John will be judging the Simmentals there. 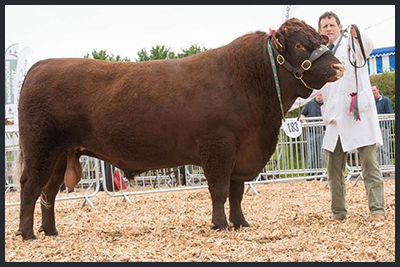 He bred consistent stock For us including Priorton Nuclear and Priorton Navigator who stood Reserve Interbreed Native Pairs and Reserve Interbreed Progeny Pairs at Royal Berkshire Show 2014. Priorton Nuclear was also Reserve Male Champion at Dunster Show 2014. Dira Drum and Bass is also the sire of the promising heifer, Priorton Show Oh La La who was Breed Champion and Reserve Native Interbreed Champion at the Cornwall Pedigree Calf Show in October 2014. No doubt he will make a great addition to the Dunbury herd. 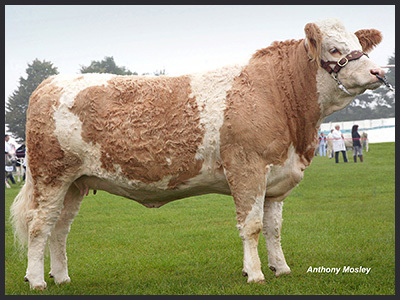 The summer of 2014 saw us enjoy a successful show season with both the Simmentals and Devons. We started off with Devon County Show, which is always a great show of Devons and we were delighted to win a very strong two year old bull class with Boskenna Donal, while Whitefield Mark My Word stood second to him. At Dunster Show we took the breed championship in the Simmentals with Sterling Rosemeary Dunesk and male champion with Priorton Extravaganza, while in the Devons we took the reserve male championship with Priorton Nuclear. Then at Mid Devon Show Rosemeary’s Dunesk took the breed championship again and then went on to be reserve Continental interbreed champion, while in the males we were male and then reserve interbreed junior bull with Priorton Extravaganza. Rosemary’s Dunesk then carried on her winning form at Totnes Show where she was any other breed champion and then in the Devons, Boskenna Donal was best bull in show. Meanwhile, at North Devon Show in the Devons we were male champion with Boskenna Donal, before we ended the season at the Royal Berkshire Show by taking the reserve interbreed native championship in the bull pairs competition with Priorton Nuclear and Priorton Navigator and we we were then reserve interbreed native progeny pairs as well.